Technology developments. A brief history of the last 15 years reveals a number of transformations in how people communicate and interact. The Internet and the World Wide Web have opened up our ability to publish and taken us from hypertext to multimedia, brought us networking and enabled us to communicate in more places: to socialize, collaborate, co-author, and co-publish. Increased availability of digital devices such as cameras and sensors enable us to digitally capture and store more about our environment. Mobile, ubiquitous, and pervasive technologies offer multiple choices about how we keep in touch. One of the consequences of these digital developments is to enable users to generate content; user outputs can be seen on blogs, wikis, and social networks such as YouTube, Facebook, MySpace, and Flickr. End-users are now active content producers across online and offline environments. Concerns about the current education system and in particular the role of technology. There is mixed evidence about the effectiveness of current educational technology use (e.g., du Boulay, Coultas, & Luckin, 2007; Selwyn, 2007), recognition that learners often dumb down their expectations with respect to technology when they enter formal educational establishments (Puttnam, 2007) and growing recognition of the need for policy reform. A blurring of the boundaries between designers and users. From the introduction of the first examples of technologies that were designed to support learning some have built systems without considering users but some have focused on user needs. This has supported an increasing trend towards participatory design methods. The convergence of these parallel developments results in a situation where more people have the technological means to engage in system reform. There is the potential for both a participatory democracy and for technological and design reforms to enrich learners’ educational experiences, making them more effective learners and participants in a reform agenda. However, there is a particular tension within the current system around the extent to which formal educational institutions can cope with the more informal communicative approaches to digital interactions that new generations of learners possess (Luckin, Logan, Clark, Graber, Oliver, & Mee, 2008; Clark, Logan, Luckin, Mee, & Oliver, 2009). LGC is about trying to find a framework that might support the more effective use of technology to support learning. It is about opening up the process through which knowledge is constructed and understanding is gained. 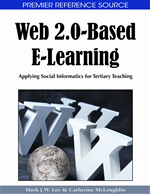 The enterprise of the LGC group (members of which authored this chapter) is precipitated by a recognition that a combination of factors have brought educators to a particular point in the evolution of learning with technology that requires reflection on how things might work better. The group’s work is inherently interdisciplinary and its (admittedly ambitious) desire is to appeal to and encompass a huge sphere of activity that includes a great deal of education.